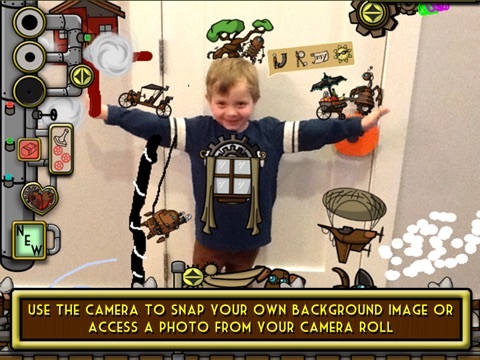 Sendy: Steam-Paint Kids is a creative art app that allows children of all ages to explore their imagination through drawing, writing, and story-telling. This simple to use digital canvas offers a wide variety of colors, stamps, paint options, and cute sayings that will allow children to create magnificent masterpieces they can share with family and friends. At first glance this app seems quite simple, but once you get in and start exploring the various drawing and stamp options, you will find there are many ways to create various futuristic and fun drawings. 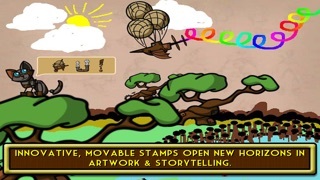 Without much direction, this app allows children the freedom to explore various colors on an animated steam engine located at the bottom of the screen, as well as various painting, drawing, and stamp options on the side tool bar. There are various background color options in addition to a photo feature that allows for drawing on a custom background created from your own photos in your photo gallery, or by photos taken within the app. 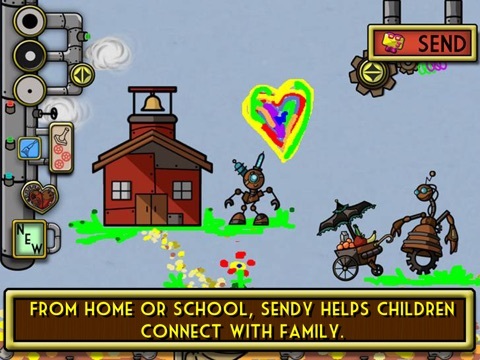 The simple animation and huff and puff sound effects that play as the steam engine moves along the track are done quite well and adds good visual component to the app. The illustrations and graphics within the stamps and Rebus sections include various robots and other futuristic items that provide interesting pictures for children to use to create their own stories. 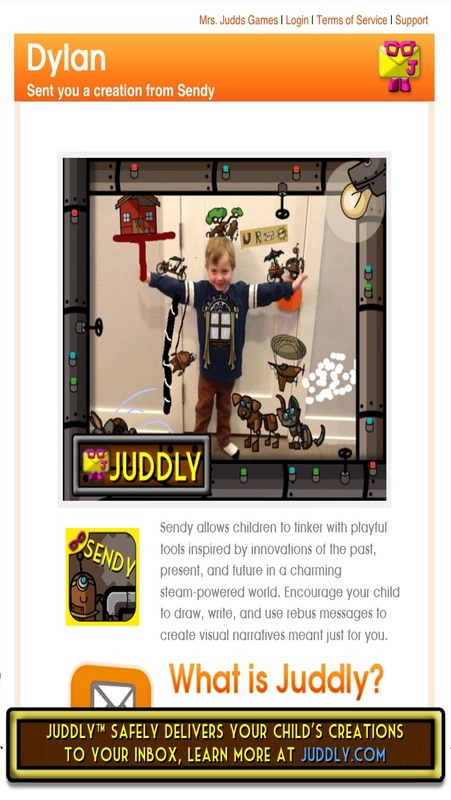 Sendy: Steam-Paint Kids is a creative app that has little to no structure and provides children a wonderful space to utilize their creativity. Children are able to use the app to create various pictures, work on handwriting, or simply color for the fun of it and since there is little structure, there are no specific educational benefits in the app itself. Any educational value for this app will be in how it is used. In the parents/teacher section on the main page, the developer has added information as to how to incorporate this app into a fun educational learning opportunity for children by asking questions about the future, robots, and various other topics. While this section does provide some insight on how the app can be used, it also leaves it open to the creativity of parents and teachers so they can utilize it as they see fit. Giving a child the freedom to create whatever they choose with little to no boundaries can be wildly fun and this app does just that. 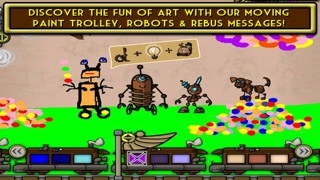 There are various ways children can use their creativity and imagination in this app through drawing, painting, or creating a story with the various robot themed stamps. They can use any or all of the 27 colors to write their own messages and can even take a picture and draw on it as a custom background. Once their masterpiece is complete they also have the option of sharing it with their parent if the parent has set up the Juddly system. The Juddly system allows parents or teachers to receive pictures through a secure one way email system powered by Juddly.com. Even without using the Juddly email system, this app will provide ample entertainment for children, especially those with active imaginations. It is true you can get a good quality app for free and Sendy: Steam-Paint Kids is proof. With all the fun details and options for creating fun pictures and drawings you might think you would have to spend a bundle, but not with this app. This is definitely a great value! It’s always nice to find kids apps that are easy to use and don’t need a lot of explanation or instruction and this app is perfect in that sense. Children can dive right in and explore all of the drawing tools without any cumbersome instructions. The different drawing and painting tools are easy to use and children can easily size and move the stamps and Rebus sayings around their picture as they make the perfect drawing. Parents don’t need to worry about any social media links, in app purchases, or advertising because this app doesn’t have any of that. The only thing that parents might be a little leery of is the Juddly option. This option allows parents to sign up with Juddly.com using their email address and their child’s name and age in order for their child to email them their creations. This is a nice function to have, however I can see how some parents might get a little concerned with sharing pictures via email in a children’s app. 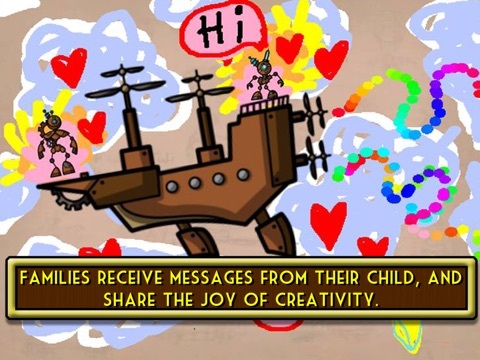 With that said, parents don’t have to use this function as children can still create and have fun drawing, however there doesn’t appear to be a way for them to save their masterpieces unless they use Juddly to send them.